Scientists say it could have been a probe from another space-faring civilisation, sent to investigate us....but one that built a craft that can travel at nearly 200,000 MPH. Or it could just be an oddly-shaped space rock ejected by a giant explosion. The interstellar aliens explanation sounds way cooler, though. 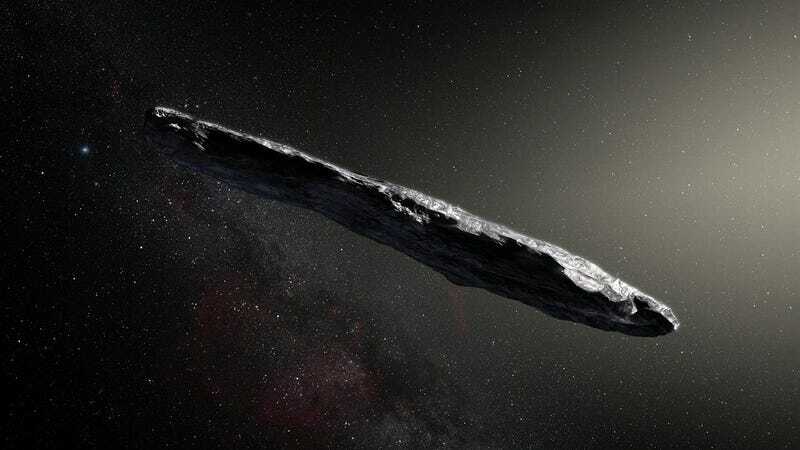 ‘Oumuamua is long gone from the inner solar system, but the mystery surrounding the interstellar interloper has been rekindled, thanks to a research paper written by two Harvard astronomers. On ‘Oumuamua’s arrival, scientists found that the object measured 800 meters by 80 meters by 80 meters (approximately a half mile long and 260 feet in diameter) and took a hyperbolic path through the Solar System. In other words, it wasn’t orbiting the Sun—its angle and speed suggested that it was visiting and then leaving. We will probably never know but if we did fund the vessel to track it we need to get going quickly as we may not be able to catch up. They took a look and decided to leave. True, but I accurately reflected the opinion of the scientists didn't I? "Mr Spock, you are being too rational." A nice clear view on this from Martian Wolf. We certainly didn't get a close up view. Oumuamua slingshotted past the Sun on Sept. 9, 2017 at a blistering speed of 196,000 miles per hour (87.3 kilometers per second) on its wayback out of the solar system. It will continue to slow down until it reaches a speed of 26.33 km/s relative to the Sun, the same speed it had before its approach to the Solar System. It will take the object roughly 20,000 years to leave the Solar System completely. It’s headed towards the constellation of Pegasus.